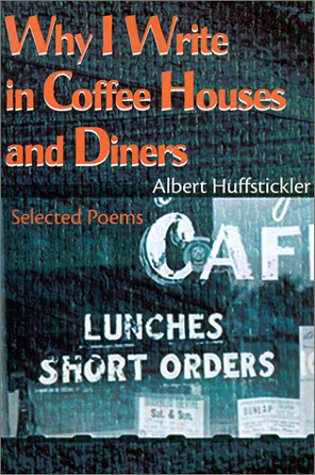 Albert Huffstickler (December 17, 1927 – February 25, 2002) was an American poet. Albert Huffstickler was born in Laredo, Texas, surviving a twin who died at birth. As the son of a teacher and soldier, he and his two siblings (a brother and a sister) moved often growing up. After graduating from high school, he worked in Charlotte prior to attending the University of North Carolina where he discovered poetry. Marriage and children followed as well as various jobs in Florida and Arizona, where he briefly studied Scientology. Drafted in 1954, he spent two years in the army. After completing armed service he returned to Texas where he attended Southwest Texas State University, majoring in English and developing an interest in Jungian psychology. During the 1960’s Huffstickler continued writing poetry as well as pulp fiction, publishing under a pseudonym. Huffstickler published hundreds of poems in his lifetime in both chapbooks and academic and underground journals. A longtime relationship with Waterways: Poetry in the Mainstream led to numerous publications in that journal. He published many of his own poems under his Press of Circumstance imprint. Huffstickler’s over thirty collections include Working On My Death Chant, The Cosmology of Madness and Dishwashers and Other Forgotten Angels. The Wander Years was published in 1998 by SRLR Press. Why I Write In Coffee Houses and Diners, a collection of selected poems, was published in 2000 by IUniverse. Poems were also antholgized in Grow Old Along with Me: The Best is Yet to Be (edited by Sandra Martz for Papier Mache Press, 1996) and I Feel a Little Jumpy Around You: A Book of Her Poems & His Poems Collected in Pairs (edited by Naomi Shihab Nye & Paul B. Janeczko for Simon & Schuster, 1998). Late in life, Huffstickler took up painting, sometimes selling his artwork or showing it in local venues. He also did volunteer work in hospitals, including the state hospital, and other care facilities. 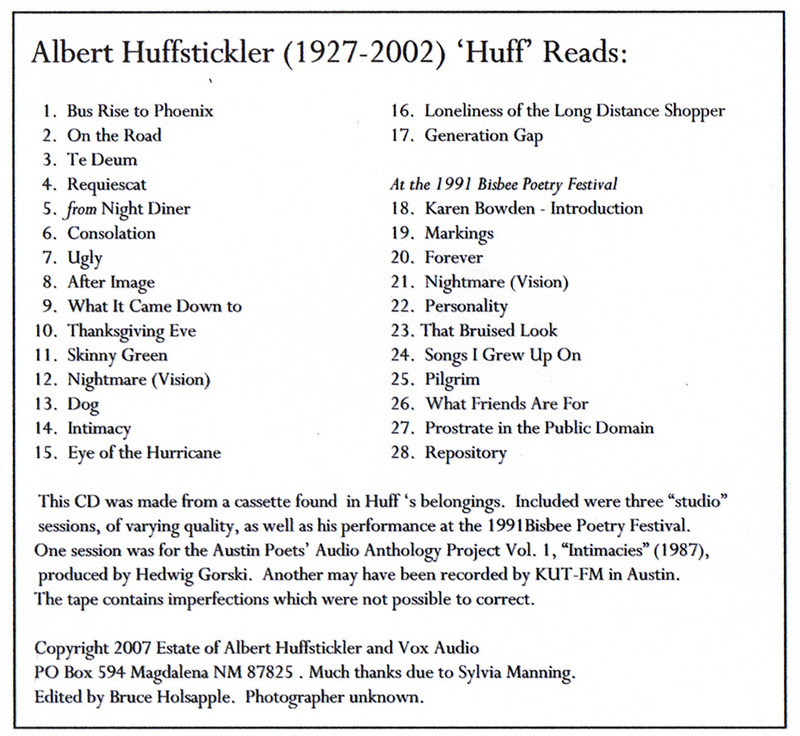 A film documentary on Huffstickler, Holy Secrets, by Matthew Listiak, highlights his personality and poetry. A longtime resident of Hyde Park neighborhood in Austin, Texas, Huffstickler died on 25 February 2002, of an aneurysm.